This humorous e-card describes how many of us may feel about exercise. When we are active, our skin is flushed, our hearts race and we become sweaty and out of breath. We are in a very uncomfortable situation and we hate feeling so terrible. We use excuses to avoid feeling this way, even going as far as to say we are allergic. 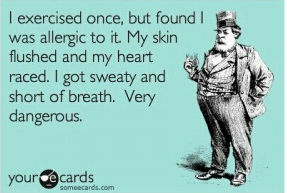 Do you think you may be allergic to exercise?